In the middle of the desirable village, of Hollingbourne, this immaculate well-loved cottage is perfect for a walking holiday or base in the Kent North Downs. The Pilgrim's Way and North Downs Way pass through the village and you can reach 900 year old Leeds Castle, known for being 'loveliest castle in the world', in just 5 minutes by car. Warm, sumptuous and highly attractive sums up what Pilgrim Cottage feels and looks like. This 1840's cottage has original wood floors, beams and fireplaces. There is a log burner for chilly nights and all the mod cons available to make your family holiday complete. 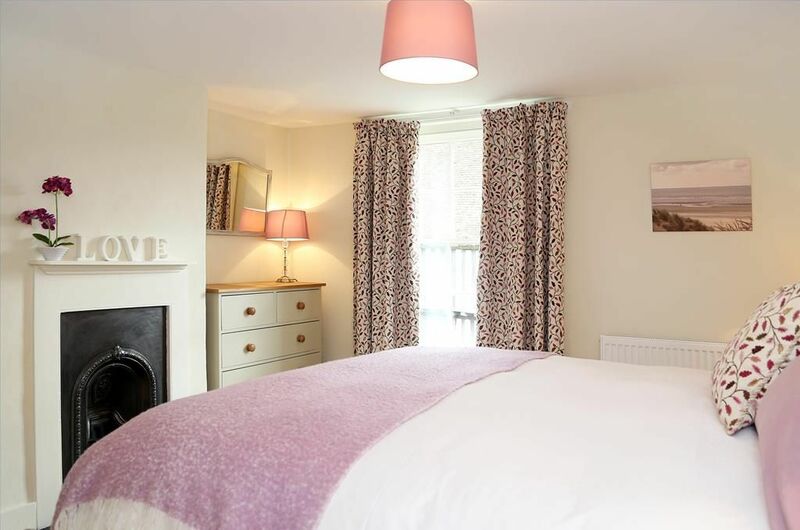 Choose from 3 inviting bedrooms, some with their own bathrooms, ideal for families or a group pf adults. The cottage's interior is high end and has been decorated in soft soothing colours, with splashes of bolder blue. The accessories and furnishings have been carefully chosen by the owners to create the idyllic country cottage. Imagine a summer BBQ, dining al fresco in the lovely sunny garden, or in cooler weather, gathering around the log burner to play board games, or relax with a glass of wine and a movie.Enjoy family meals together in the attractive, spacious country kitchen or alternatively dine at one of the three village pubs, one is just across the road, the 13th Century 'Dirty Habit' with it's delicious, seasonal menu. Stay in a village cottage, enjoy local produce in a local pub, Kent at it's best. The cottage is very welcoming and very well equipped. The personal touches and decor really make for a comfortable stay. Will definitely recommend this location to friends etc. Thank you for your lovely feedback of Pilgrim Cottage, we are pleased that you enjoyed your break and hope to see you again. Thank you for your review. I am pleased to hear that you enjoyed your stay and hope to see you again soon! The perfect English Village cottage. The perfect cottage to stay in Kent. Wonderfully well equipped. The accommodation offers a true home away from home experience. We hope to be back soon. Thank you for your lovely review, we are delighted you enjoyed your stay at Pilgrim Cottage. Lavender cottage is a charming place. Its very clean and very well stocked it is a roomy 3-bedroom cottage perfect for 6 people. The living room set up is unusual as it two rooms that has part of the wall missing due to the old beams with the rooms blocked of by the fireplaces. This added a really cool feel to the place and totally added character. The 3rd bedroom (blue one) has no wardrobe/closet which will be a pain if your the one staying here and need to use one. I was worried that the road and pub would make this a noisy stay but none of that was a bother at all. We definitely will be saving this for future visits. It's in the heart of the country opposite a really nice pub/restaurant which is worth having dinner here one night. I would happily have given this cottage 5 stars had it come with a manual or something like that. It took me ages to figure out the heating, not being familiar with this system and how it operated was a huge pain in the rear, we where freezing for hours until I was able to google it! Also had to search for the wifi and passcode and had no idea where the rubbish/trash needed to be taken and when it needed to go out. Also had no idea what they wanted turned of etc... when I left the place. The parking is on a very busy road and not very convinient but after a couple of week we got used to that. I would highly recommend this lovely cottage. Thank you for your lovely review, we are delighted you enjoyed your stay at Pilgrim Cottage. Your comments are noted with regards to instructions in the property and have been passed to the owner. This was a wonderful cottage. We came to England for a wedding and the dinner and reception was across the street at the Dirty Habbit it was all so convenient. The cottage was spacious and very clean everything we needed. Hollingbourne is a village located on the southward slope of the North Downs, not far from Maidstone.Hollingbourne even appears in the Domesday Book as Hoilingeborde. The North Downs is a haven for walkers and cyclists alike, with pretty country villages to explore. Ashford International Train station, with direct service to Paris is 20 minutes away. Hollingbourne has it's own mainline station with direct service to London Victoria, perfect for a day out in the capital too.